"အျပင္မွာ ေရာက္ေနတဲ့သူေတြေကာ၊ ေတာထဲမွာ ေရာက္ေနတဲ့သူေတြေကာ ျပည္တြင္းထဲကလူေတြေကာ စိတ္ခ်မ္းသာ ၾကည္ၾကည္ႏူးႏူးနဲ႔ ေနႏိုင္မယ့္ အျခခံအုတ္ျမစ္ေတြကို ခ်ဖို႔လိုတယ္။ အဲဒါေတြ ရွိၿပီဆိုရင္ ဘယ္သူမွလည္း လက္နက္ကိုင္ တိုက္မေနေတာ့ဘူး။ အဲဒါမ်ဳိးျဖစ္ဖို႔ အဓိက က်တယ္ေပါ့။ အဲဒါမ်ဳိး ေဆာင္ရြက္ေစခ်င္တယ္"
Four leading members of Vahu Development Institute (VDI) will participate in a couple of workshops in Naypyidaw next week and will attend several workshops in Rangoon during their two-week trip to Burma, according to Aung Naing Oo, the deputy director of VDI. He said Zaw Oo, the director of Vahu, will attend the Education and Health Workshop, organized by the UNDP in Naypyidaw on Feb. 13, as well as the Small and Medium Enterprise (SME) workshop. “We will also be attending workshops in Rangoon to represent issues related to economic development,” said Aung Naing Oo. The workshops in Rangoon will be organized by the Union of Myanmar Federation of Chambers of Commerce and Industry and Myanmar Fishing Industry. 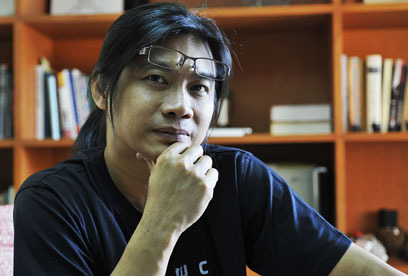 VDI deputy-director Aung Naing Oo returns to Burma after nearly 24 years in exile. 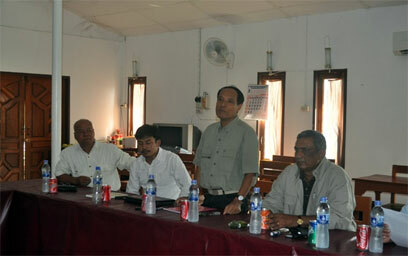 Four VDI founding members—Zaw Oo, Aung Naing Oo, Aung Thu Nyein and Tin Maung Than—return to Burma on Friday, Feb. 10. Senior Associate Aung Thu Nyein said the trip was an observation mission with a view to opening a VDI office in Burma. 'Our main intention of going there is to assess the situation and to see how we can help the current changes in the country', he added. Over the fortnight they said they hope to meet with government officials, private businessmen, NGOs and student leaders. It is not sure yet whether they will have an audience with Burmese pro-democracy leader Aung San Suu Kyi. “We will try to get an appointment, but she is very busy with her campaign,” said Aung Thu Nyein. 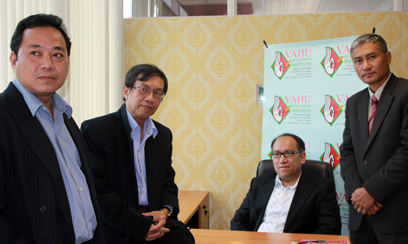 VDI is a Thailand-based think-tank for research and training, dedicated to working for political reform in Burma, as well as economic and civic society development. Director Zaw Oo attended the government’s economic forum in Naypyidaw in August last year. Leaders of armed dissident group, the All Burma Students’ Democratic Front (ABSDF), held their first ever negotiations with a Burmese government delegation on Thursday at the Thai-Burmese border, and agreed to a further round of talks aimed at a ceasefire and a peace agreement. Speaking to The Irrawaddy after the historic meeting in Mae Sot, ABSDF Vice-chairman Myo Win said the day's talks with Naypyidaw's Union-level Peace Discussion Group were a first step, but that no agreement had been signed. He confirmed that both sides had agreed to further negotiations. He said that no date had yet been set for the second round of talks. The ABSDF was established by Burmese university student activists in 1988 after they fled to Burma’s border regions in the wake of a crackdown on pro-democracy demonstrators. The government delegation was led by Saw Khin Soe, a retired army officer, in place of Aung Thaung, the head of the Naypyidaw peace delegation, who was unable to attend. “We can say that we spoke frankly to each other and with respect,” said Myo Win, a former Rangoon University student who joined the ABSDF at its forming nearly 24 years ago. The ABSDF is allied with ethnic rebels such as the Karen National Union (KNU) and the Karenni National Progressive Party, both of which helped students in 1988 when they arrived at the Thai-Burmese border by providing shelter, food, weapons and training. The Naypyidaw peace delegation has already reached ceasefire agreements with several armed ethnic groups, including the KNU, Shan State Army–South and the United Wa State Army.